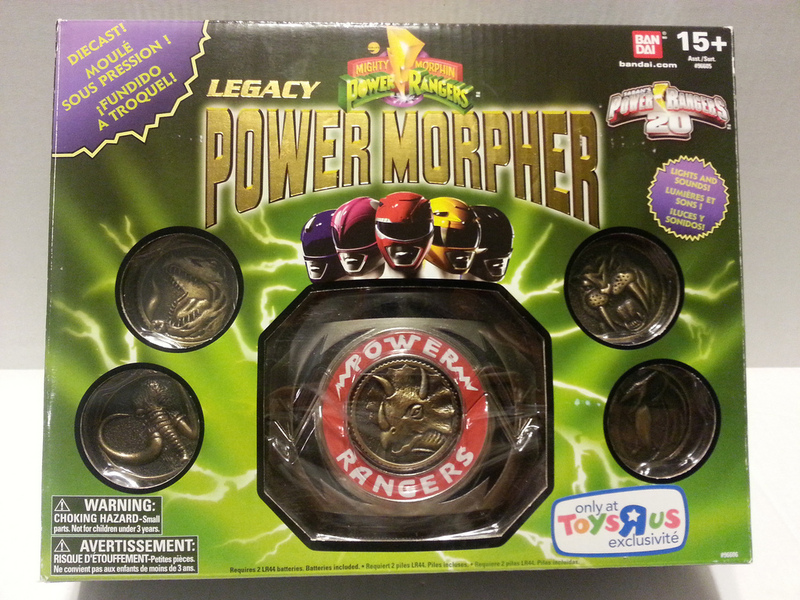 How does the Power Morpher Come Packaged? Actually, it didn't. 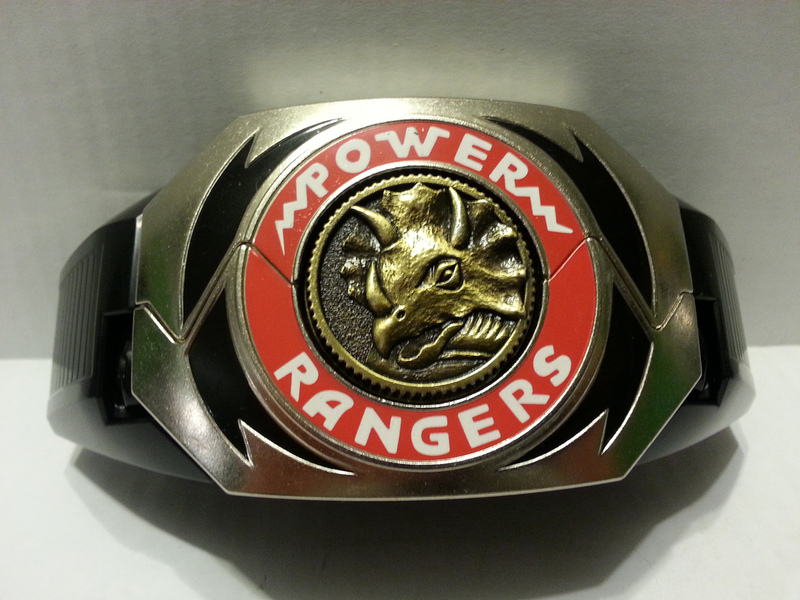 It was given to me by Alpha 5 after Zordon sent him out to find some dude in his late 20's with attitude. 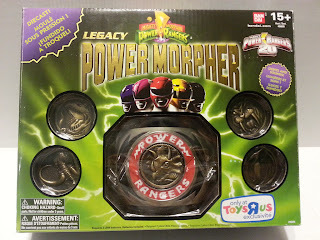 When you pick yours up, however, it comes in this box (see picture below) that features display windows so you can see the Power Morpher and all of the coins. Diecast metal and plastic. The silver part on the front and the handle are made of metal. It's a really heavy duty piece and weighs about 1/2 a pound. Seriously, you could melee a Putty with it. The back of the Power Morpher and the translucent red interior are made of a very thick, heavy plastic. This is definitely a good quality piece and doesn't feel cheap in the least. It feels like an actual prop Morpher rather than a toy. You mean like will it really turn you into a Power Ranger? No, it will not. No, I mean does it have lights and sound and such? It has a power switch and when you flip the switch to the "on" position, it plays the little communicator diddy (Beep beep be boop be boop). On the left side of the handle is the button to activate the Morpher. 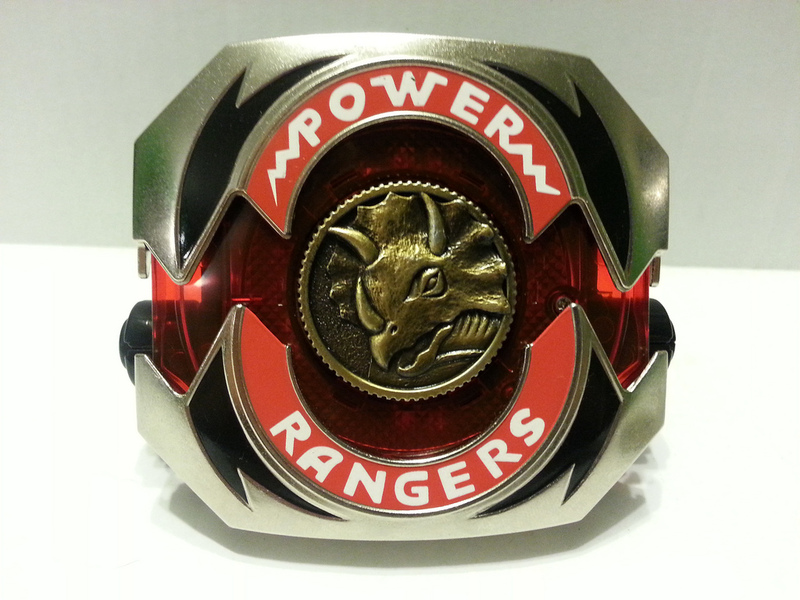 Press it and the top and bottom halves of the Morpher separate, revealing the translucent red interior and playing some kind of noise that sounds like glass breaking. One of the four lights on the interior also flashes. Hold the button down longer and it will actually play the entire Power Rangers theme song (music only, no words) with the lights flashing in time to the music. This would be great to have at a rave. That translucent red stuff is jelly. From what I can tell, the Legacy Power Morpher does an exceptional job of replicating it's on screen counterpart. The "Power Rangers" emblem and the black flares on the front are not decals. They actually seem to either be painted or or some type of enamel. The metal front and sides are all really smooth with a dull shine. On the back, there's a really cool gold emblem that looks like either a very stylized "Z" or perhaps an hour glass. I don't recognize it and couldn't find any info about it, but it is surrounded by gold vines and two red dots. The bottom rear edge of the Morpher and top rear edge (which folds down to become the handle) each have a sticker that features the ranger colors. I have no clue what that is, but it's kind of cool. What are are the coins like? The coins are metal and feature reliefs of the dinosaurs on the front (Mastodon, Pterodactyl, Triceratops, Sabretooth Tiger, and Tyrannosaurus) and the Mighty Morphin Power Rangers logo on the back. The images feature a really heavy dark wash, so they're not bright gold as depicted on the packaging. 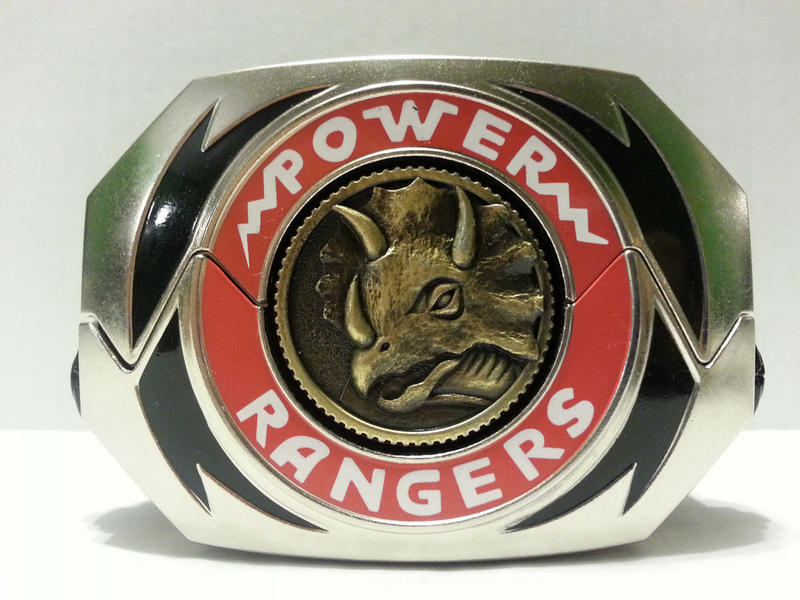 There's also reeding around the edge and the coin simply fits into an indentation in the Morpher. It's removed by pushing a panel on the Morpher's back. These are each valued as $10 in currency at Morphicon. 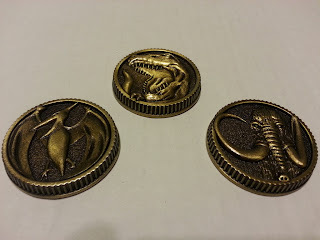 Why isn't there a Dragon coin? Good question. The simplest guess would be either A) Bandai is replicating the original morpher from the 90's which did not come with the Dragon coin or B) Bandai plans to release the Dragon coin along with another Legacy item in the future. Of course, it could also be due to the fact that the Green Ranger's morpher was different from the standard morpher in that it was more gold in color, so that coin clearly would be incorrect if included here. Anyone else remember Pogs? Just asking! Billy, followed closely by Trini (RIP Thuy Trang). What's the deal with the belt buckle attachment? The set does come with a hard plastic belt buckle that can attach to a belt (preferably one with no other buckles) and holds the Morpher safely inside. 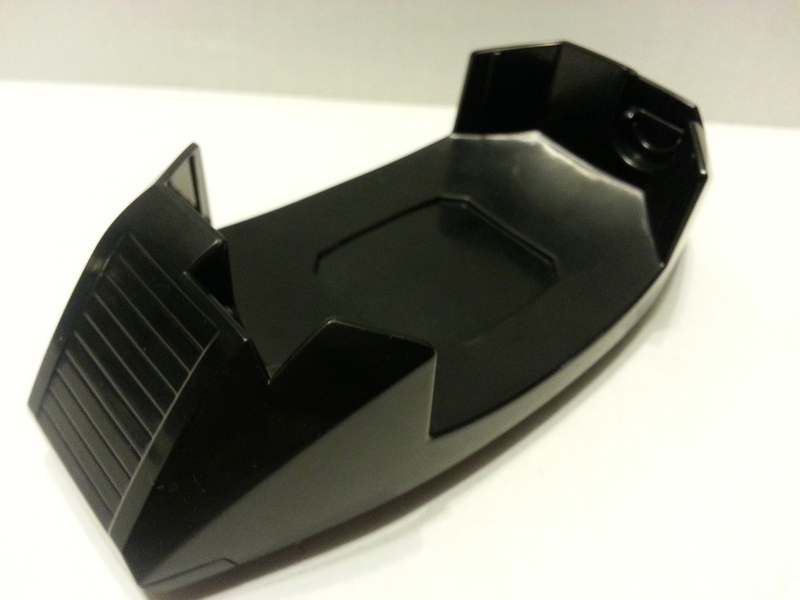 The Morpher snaps in easily and is very secure. I tried to shake the Morpher out, but was unable to, which is a good thing for fans who either want to use this for cosplay or wear it out on the town to proclaim their love for the Power Rangers. 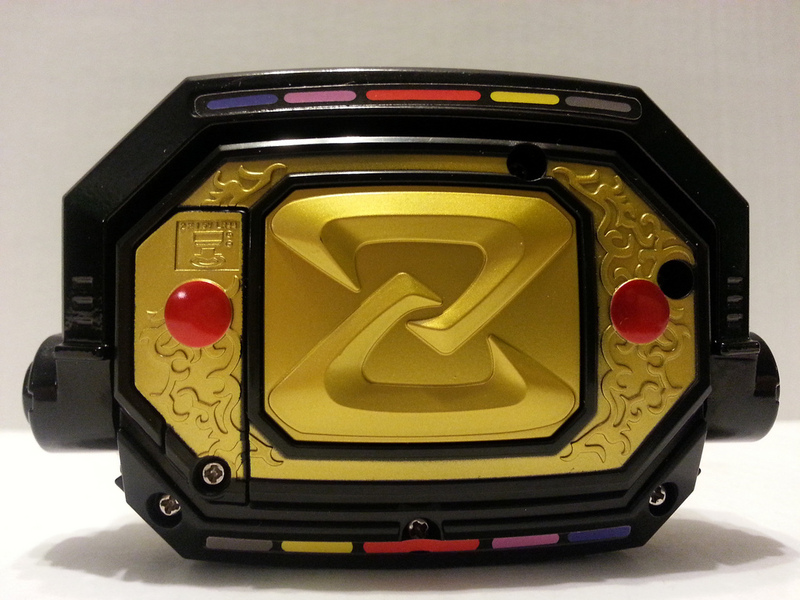 How does it compare with the original morpher? I owned the original morpher as a kid and remember loving it. Brad lent me his original childhood morpher for this review, so here's a comparison shot of the two. Mine's on the left, Brad's is on the right. Mine's the one that bigger. 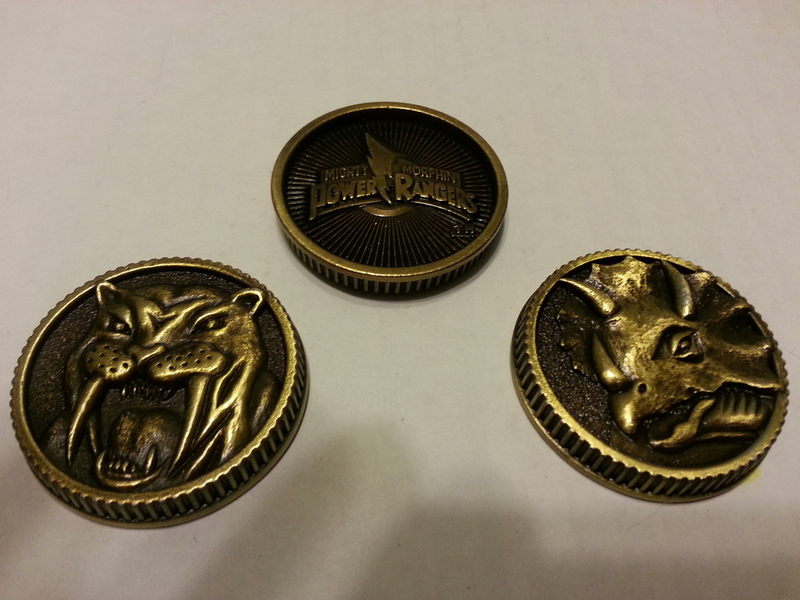 The original is made out of plastic while the Legacy morpher features a metal front. 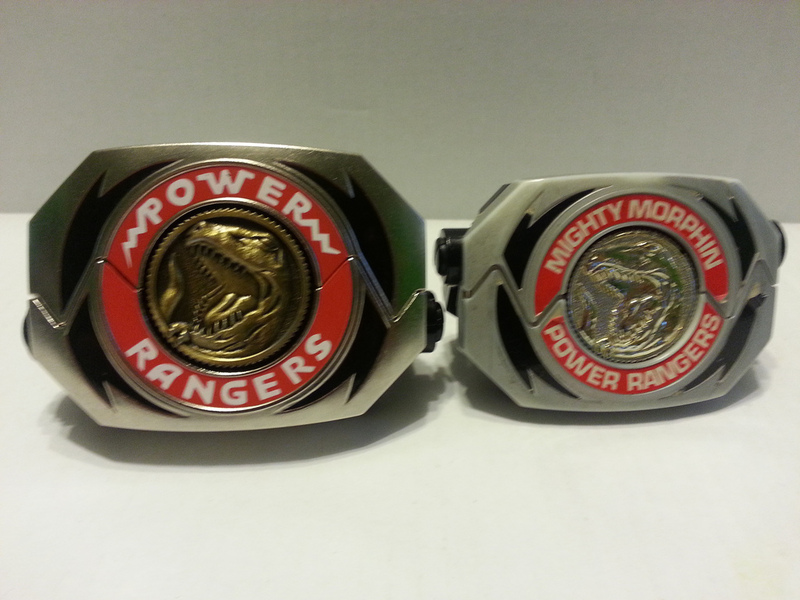 Also, the original Morpher has "Mighty Morphin Power Rangers" written on the front while the Legacy edition is more show accurate in that it only reads "Power Rangers." 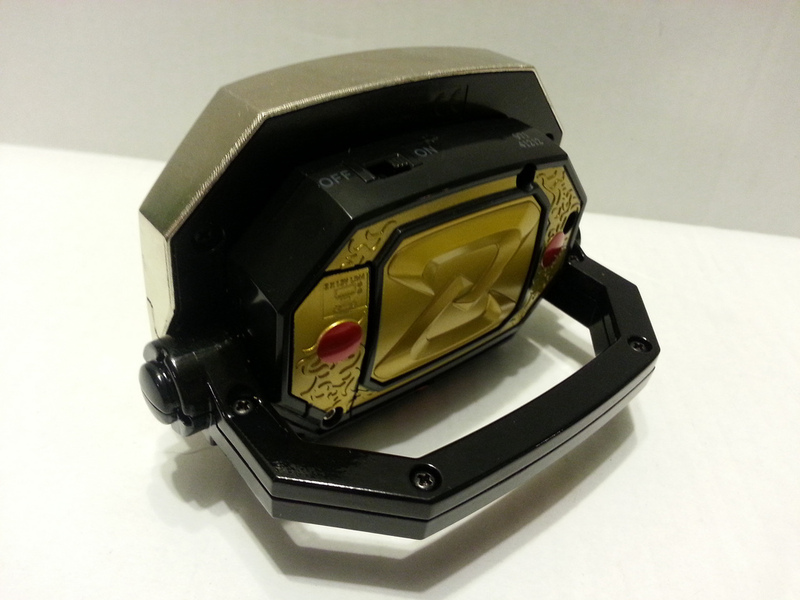 There are no details on the back of the original Morpher and it doesn't play music like the newer version. The activator buttons are also on different sides.  Did you find any flaws or problems with it? Only one, and it's a problem that the original Morpher doesn't have. On the Legacy Power Morpher, the rear handle handle feels like it's set set too low for the user to slip their hand in and push the Morpher button. I actually have an easier time activating holding and activating the button on the original toy. Maybe I just need to practice more? I guess that I'd also recommend being careful with the clips for the belt buckle. They're a very solid plastic, but they feel like they could potentially be brittle. You can also the Morpher as a snazzy holder for your autographed picture of David Fielding. What are your overall thoughts on this piece? I'll reiterate what I said above. I'm not a lifelong Power Rangers fan by any means, but the first year or two of the series still hold a great deal of nostalgia for me. I hadn't planned on buying anything Power Rangers ever again, but when I learned about this item, I decided that it was a perfect piece for my collection. I'm confirming it as a Great and a 1/2. If the handle had been positioned a little better, I'd easily give this an Epic, but as it is, it's a tad hard to properly use in a comfortable way. It's also a little on the expensive side, but that's not really affecting my score. I think this can safely be recommended to any fan of the original Power Rangers who appreciates prop replicas and pop culture collectibles, as it's clear Bandai put a lot of thought and quality into this item. Barbecue17 has two favorite Power Rangers villains: Bones and Finster. If you have them, please send them to him! He'll gladly take pictures and put them on his Flickr account. The stylized Z on the back of the morpher is an insignia relating to a show called Kyoryu Sentai Zyuranger, one of numerous installments in the Japanese Super Sentai franchise - and more specifically the series that the very first season of Power Rangers takes the majority of its fighting/monster scenes from. 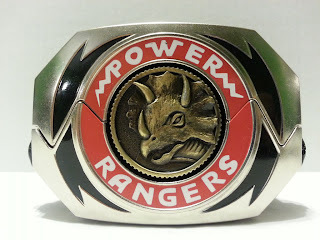 In Zyuranger - which focused on a group of warriors from prehistoric times continuing their battle against the evil witch Bandora in modern day - the heroes would wear their transformation devices as belt buckles (hence the name "Dino Buckler") in both superhero and civilian form, with the Z-emblazoned side facing front when they were out of costume. Thank you so much for that! I was really curious what that Z was for and I'm glad I now know. The handle isn't too low, the old toy was upside down so they could put "Mighty Morphin Power Rangers" on the front. The Legacy one is accurate to the show. Besides the Legacy, I have the old toy with stickers from Repolabels.com that make it show accurate. Cuz I'm a nerd.